Your passion for fishing also needs careful selection of gears! Whether you are an amateur wader or a pro wader, still the efficiency of your performance depends on the quality of your gears. Wading through waters is enjoyable when you are protected with the right gear and equipped with the right accessories. Whether you wade fast or slowly, you need the best waders to keep you going through the whole day. A great wader brings out an extreme comfort and drives you to higher performance when fishing. Shopping for waders is a headache if you don’t know the factors. It is time for you to determine your preference of a good wader. As a wise consumer, you need to consider this list of factors carefully. Bootfoot waders cover the angler’s foot up to the chest. The boots are permanently attached to waders. You will not worry anymore about having another decision just to buy boots separately. However, you have no freedom to use other boots in case you are not comfortable with the boots. Regarding storage and organization, bootfoot waders are bulky. Stockingfoot waders cover the angler’s foot up to the chest like the bootfoot type. However, neoprene socks are attached instead of boots. With this design, you have the freedom to choose a separate boot of your preference. An obvious drawback is the separate purchase of wader and boots. But, at least, you can use the boots for another purpose. 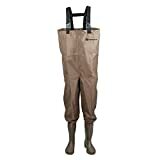 Concerning storage and organization, stockingfoot waders are lightweight yet not bulky. Most of the fishers find the stockingfoot type easier to take in and out. 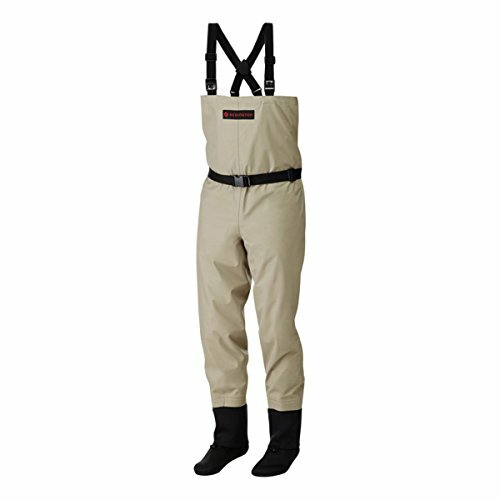 Hip waders are used when wading into shallow waters with slow current. Some manufacturers choose to attach the hip waders with boots while some do not. Hip waders cover the angler’s foot up to the upper leg. Fishers find hip waders more comfortable and easier to take in and out compared to both bootfoot and stockingfoot. But it is only best to use this wader when you are in a wading in a calm river. 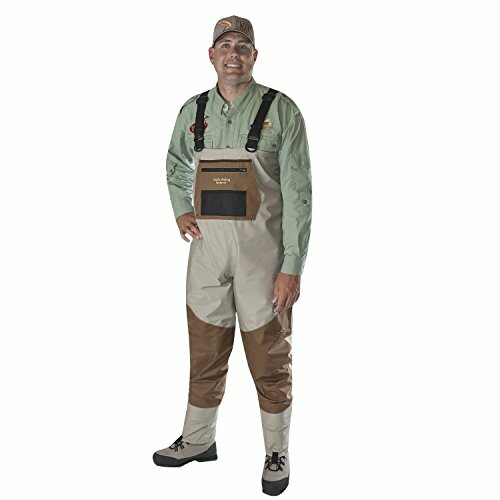 Wading pants have the same purpose and length like the hip waders. However, it is designed like you are using regular pants. Its fit is also like your regular pants. Neoprene waders are commonly used when fishing in a colder climate and more frigid streams. Neoprene primarily has a thick characteristic which makes it ideal for cold circumstances. If you are fishing in cold water, the typical thickness for neoprene is 5mm. However, 3mm thickness is also used for cases when it is not so cold but far from warm. Problems arise when neoprene waders are used in warm weather. Neoprene waders do not have a breathable characteristic which may get you disturbed with a warm feeling. 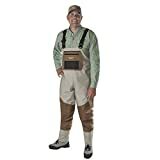 Breathable waders is designed to keep you stay warm, dry, and comfortable for a long duration of fishing. It is commonly optimized to be resistant from water yet still allowing heat and sweat to escape. In case you are fishing in different weather conditions, breathable waders are advisable. Good quality waders ideally consists of breathable and lightweight characteristics. If you can find a wader with these features, it is highly recommended though you somehow need to scrutinize the product reviews. When a wader is lightweight, it brings the most comfort. Your performance must not be limited with the struggles of coping up with a heavy wader. Color does not matter! Some colors may appeal for a given situation, for instance, a camouflage wader for duck hunting. However, the features matter the most. It is all about personal preference, and you have to be firm on your decisions when choosing the right wader. Mackenzie Wader is good to use even if you are running low on budget. 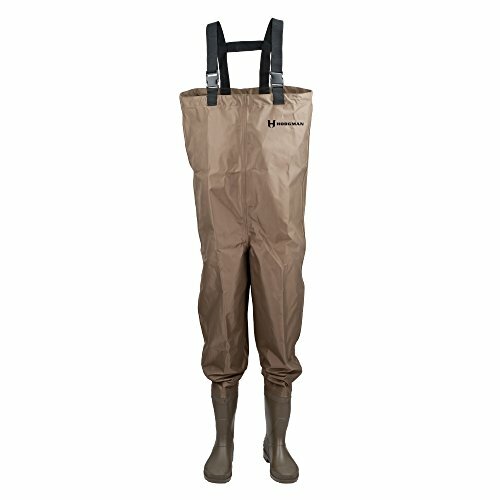 Hodgman remarkably manufactures this affordable wader without sacrificing the quality and performance delivery. Rest assured, it can compete with other waders as well. This wader utilizes a sturdy nylon shell fabric. This material is known to be 35% lighter than waders using rubber fabric. On top of that, the fabric has a flexible characteristic which lets this wader adapt well to your body. Also, it has less chafing characteristic in case you are worried about sores and blisters after using it for long. These features are positively compared to rubber fabrics. If you need to bring a little important stuff while fishing, this wader has an internal pocket included in it. On my first try, I got home with wet socks. Apparently, there’s a leak in my waders in just a few hours of use. I can’t precisely locate a hole that causes the leak. I tried putting some super glue where the boots and pants meet. Still, there’s a leak on my second try. The boot utilizes polyvinyl chloride (PVC) material which is 25% more durable than rubber materials. If you, as well, are not a fan of rubber materials, then you are in perfect match with Hodgman. Waders could be too tall for your chosen boot size. A lightweight wader might give you a feeling of not wearing any wader at all. Rest assured, you’ll receive the benefits of this wader on your fishing activity. Caddis boasts about the breathability of this wader as an ultimate feature. Through utilizing CaddisDry fabric, you’ll experience the best of both waterproof and breathable layers. Though water is hindered to go through the layer, you’ll still receive the benefit of a cool and dry feeling. This is made possible by using durable polyester materials. As a quick note, polyester fabrics are known to be strong, durable, and resistant to shrinking, wrinkles, and abrasion. Polyester is hydrophobic which makes the material dry quickly. The feet of this wader is stitched and secured with double-taped glue. This design ensures your feet to stay warm and dry despite the duration of use and current weather condition. This wader has quad pockets in case you need to bring some necessary stuff while you’re fishing. There’s a problem on every wader with breathability and waterproof features. When you are getting deeper, for example, a waist-deep fishing, the holes for breathability seems to allow a small amount of water. It is waterproof on selected water levels only. Unlike other waders on the market, this wader does not include boots. Since the boots and waders relation are sometimes optimized on a “one size fits all” concept, this wader gives you the freedom to use the boots you love. Proper fit of both waders and boots, purchased separately, is a reasonable design concept. This wader belongs to the affordable variety in the market. Despite the price, Allen Company assures a good quality for this wader. This has been one of the popular choices for fishers due to the combination of quality and cost efficiency. The sturdy cleated soles are strong and durable. Also, this wader is primarily made from nylon which is lightweight in nature without compromising durability. Regardless of your size, this wader will fit well through its adjustable suspender. These features contribute to a comfortable feeling once you wade through waters. This wader is relatively simple in design. However, Allen Company ensures the seams not to fail and leak easily. Just a tip for meticulous users: a waterproof glue is simply enough to fix the leaks. When I removed this wader from the packaging, the plastic smell spread out. I need to do a quick wash which consumes time. Or I may let the smell run off when I’m in the water while fishing. I need to suffer from the plastic smell for a little time on the second option though. Most users find this wader to be built for use in warm climates. When you are fishing on colder climates, you may consider buying a larger size to give space for warm clothes and protective gear. Just use this tip if you want to fish comfortably on cold climates. Most manufacturers ignore the beauty of wading belts and belt loops. Redington managed to visualize the effectiveness of using waders with belt loops. This wader ensures secure and snug fit – a type of fit which would hold tightly in place. Redington Crosswater waders are breathable due to the neoprene fabric. This is a significant advantage on cold climates. It also has three layers polyester to keep this wader lighter. On top of this fabric is a durable water-repellent coating. The surface is treated with fluoropolymer base to assure you with a significant water resistance. 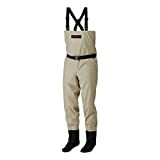 This wader features gravel guards with hooks to provide a secure and reliable connection between the wader and the boots. Also, it is designed with opposing buckles which make an easier adjustment of the belt up to waist high. This wader integrates a small external chest pocket. The chest pocket itself has another flip-out pocket. Most users find it impressive as the chest pocket gives a pocket location and handy advantage. The performance of this wader is commendable. But it does not last long. This wader is with me for just less than a month, but leaks already started to show up. I tried returning this product, hoping for a replacement. Sadly, the condition of this wader does not allow replacement. With waders in this price range, it satisfies your everyday fishing needs. Its quality is enough to make your fishing enjoyable and comfortable at the same time. Frogg Toggs’ Cascades comes with a classic boot foot design with adjustable suspenders and adjustable drawcord. This creates a snug fit for any user. Also, it utilizes a 2-ply 300 Denier poly materials matched with Frogg Togg’s lite vulcanized rubber technology which creates natural movement without forsaking sturdiness and water resistance of the wader. This wader is fully stitched, and the seams are taped. This brought out its durability feature. It also has an inside security pocket which allows you to bring your handy stuff without the fear of soaking them in water. The rubber boots are uninsulated yet durable enough to withstand your fishing activity. It is equipped with steel shanks and sturdy cleated soles. Steel shanks are known for optimal stiffness and stable midsole support. It is somehow hard to take on and take off this wader comfortably. The calf part of this wader is somehow contoured for skinny people. My calves struggle when I’m trying to fit it due because it is tight. Also, this wader crinkled on an entire day of fishing, and it is somehow painful for me. From uppers to boots, this wader is constructed with rubber materials. Though the market is flooded with nylon-based waders, Frogg Toggs proves to bring the best of rubber technology for their waders. If you are appealed with rubber, you are in good terms with Frogg Toggs. Be equipped with the best waders, and you’ll definitely have the best fishing adventure ever! You don’t need to be disrupted with water leaks, harsh weather conditions, and struggling mobility. Whether an amateur or a pro, you need the right waders for you to enjoy wading through waters all-day long. Since you already reach this point, you must already have a firm decision on your most preferred wader. After all, the optimum joy you’ll receive from fishing, aided with a proper wader, matters the most!